I got pretty excited yesterday when I came across this: Hands on with Gmail's new IMAP support. 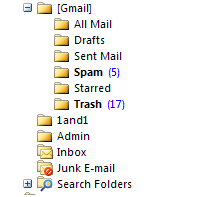 In the past Gmail has only supported POP and because of the unique way Gmail stores emails, (with tags associated with emails instead of them being in folders) it caused everything to be downloaded to your inbox, even your sent items. Starting this week IMAP has been showing up in the settings of some Gmail users and will continue to be rolled out to the rest. I can only hope that they also add it to Gmail for Your Domain in the Google Apps. Then I can finally make the permanent move away from my Hotmail account.